And I have a computer. Do you think that changes the game? 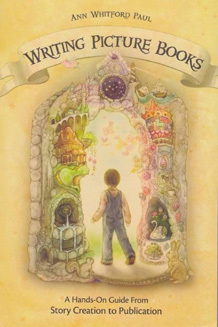 © 2011 Jane Yolen. All rights reserved. Jane Yolen sent me poem choices. Oh, yes she did. I agonized (okay... fine... in a fun way!) 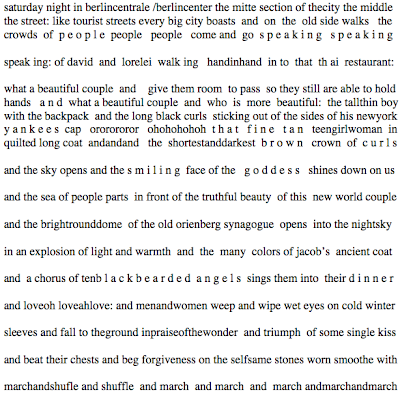 before settling on The Alphabet which, I think, is a fitting send off to 30 Poets/30 Days and National Poetry Month. The possibilities of language may not be infinite mathematically... though that's one eyepoppingly big number... yet when you add in meaning and interpretation, I'd make the argument that we'll never run out of stories to tell or poems to write. I'd also make that argument about Jane Yolen herself. Author over over 300 books (stop for a second and absorb that. 300 books! ), she is also an incredible speaker, mentor, blogger, editor, anthologist, and so much more. 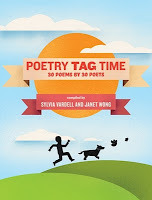 I am an unabashed fan and, just like last time she came by, I am thrilled to have her here as part of 30 Poets/30 Days. Yesterday ended with Kristine O'Connell George and Daze of the Week. Tomorrow... Kathi Appelt's What Was She Thinking. © Kristine O'Connell George. All rights reserved. Kristine O'Connell George has that poet's gift with words, I tell you. She can play with them, mold them, shape them, make them say whatever she wants to say in the exact way she wants to say it to get us readers to see things we might not otherwise see (or to laugh (like she did last time she was here) or think or or or). Lucky us! 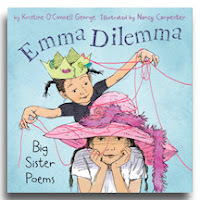 The above poem could easily be in Kristine O' Connell George's new book Emma Dilemma: Big Sister Poems which features sisters Emma and Jess. (I can speak as an expert here, too, and say that this poem could be a brother poem, too!) The link between sisters is such rich territory in her poems and beyond and, in fact, the book has a Facebook page where folks are leaving stories and photos of and about their sisters. Good times, indeed, from a poet I'm so happy to have here as part of 30 Poets/30 Days. Earlier today, Linda Sue Park was Explaining Baseball to an Alien. Tomorrow, 30 Poets/30 Days finishes off with Jane Yolen! For more information on 30 Poets/30 Days and how to follow along, please click here. They know you inside and out. My turtle shell is useless. it's hard for them to hurt me. Where's the star who looks like me? I want to be special, too. 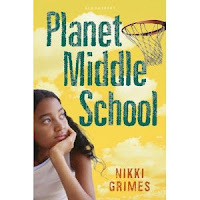 © Nikki Grimes. All rights reserved. I'm a big Nikki Grimes fan... which I think made today very hard. You see, she had sent me other poems besides these three tanka. Other tanka, a riddle, a... well... the point is, I wanted to run them all. (And yes, I kept stalling with the hope she'd send me MORE poems to choose from. Can you blame me?). In the end, I picked these three because they show how she can nail truths in a way that looks effortless. Plus, I got to share three poems! 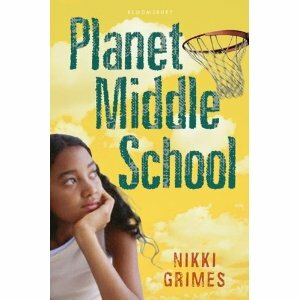 Nikki Grimes has a new book coming out in September called Planet Middle School. It's a novel in poems and, having just finished an advanced copy today, I can safely say that it's fantastic. It's funny, emotional, and exceedingly real. And, yes, it's poetry! Make sure you're looking for it in the fall. In the meantime, grab some of her poetry, sit down and enjoy, and you'll know why I'm so happy to have her here as part of 30 Poets/30 Days. We ended yesterday with Rebecca Kai Dotlich and Skating Pond. Up next... Kurt Cyrus and The Mummy and the Mermaid! For more information on 30 Poets/30 Days and how to follow along, please click here. ©2011 Rebecca Kai Dotlich. All rights reserved. Can Rebecca Kai Dotlich turn a phrase or what?! The images she paints, the feelings she evokes in the reader, the sense of time and place... and, yeah, I know. I'm falling into fanboy mode again, but what can you do? Just like last time, with Midnight Stray (who one commenter called "pretty much a perfect poem"), she's packed so much in so little space that I'm left scratching my head figuring out how she did it. Of course, it's not a surprise. If you've read her poems anywhere or read Bella & Bean, her most recent picture book, you run into the same wonderful use of language no matter the subject. And if you haven't read her... well, fix that ASAP! Then, I know, you'll see why I'm so excited to have Rebecca Kai Dotlich here as part of 30 Poets/30 Days. Earlier we had The Voice of the Voiceless by J. Patrick Lewis. Tomorrow we start off with three tanka from Nikki Grimes! For more information on 30 Poets/30 Days and how to follow along, please click here. I put each carrot in a suit. The lettuce in a scarf (how cute!). Tomatoes? Ribbons in their hair. Sneakers for the kidney beans. The cucumber's in new blue jeans. The avocado wore a dress. The onion's in a tux (oh, yes!). The jicama's in high-heeled shoes. The mushroom? Any belt I choose. The apple is a naked guy. The olive's in a shirt and tie. I put the radish in a vest. There, I think the salad's dressed. ©2011 Greg Pincus. All rights reserved. I love bringing poetry to kids (and in fact, launched Poetry: Spread the Word to enable me to do more of that), and I can't tell you how many times I've read aloud a poem by one of the 59 other poets who've been part of 30 Poets/30 Days and seen kids come alive with laughter, conversation, recognition... the works. 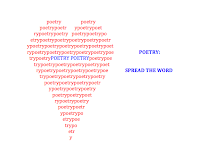 It's inspiring, as is the passion so many of you who read the blog have about poetry. I love getting to hang out with all of you, even if it's just virtually, and I look forward to sharing the rest of April and everything that lies beyond that with you, too. Earlier we had Charles Waters' I Wear Mommy's Dress. Tomorrow we kick off with J. Patrick Lewis with The Voice of the Voiceless. For more information on 30 Poets/30 Days and how to follow along, please click here. I now feel even worse! ©2011 Charles Waters. All rights reserved. When I read Charles Waters' poetry, I get the sense that he could put himself in any child's mind and give us their point of view. He captures moments and feelings (like he did last year here with I Love Being Me) that are so honest and real. It makes you think he's still a kid himself. Charles has had a wonderfully busy poetic year (you can see details over at David L. Harrison's blog), and just this past week did his first one man show of his own poetry. The lucky students at Southwest Middle School saw Poetry Time with Uncle Charles... and they saw a natural performer with the voice, energy, and passion to make anyone a poetry lover. I've been so glad to see continuing success for him, and I'm so excited to have Charles Waters here today as part of 30 Poets/30 Days. Yesterday we had On Monday I Feel Like a Dragon/El lunes me siento como un dragón by Francisco X. Alarcón. Next up, I Put Each Carrot In a Suit by Greg Pincus! For more information on 30 Poets/30 Days and how to follow along, please click here. I'm hosting #YALitchat on Twitter this Wednesday (at 9PM Eastern/6 PM Pacific). We'll be talking about non-traditional, non-waiting-around ways of moving our careers forward (such as I'm attempting with my Poetry: Spread the Word project). #YALitchat, founded by Georgia McBride, is always worth a visit. 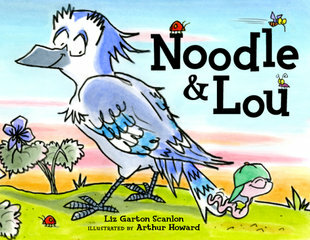 Tomorrow (Tuesday) night as usual, at 9/6 also, I'll be co-hosting #kidlitchat with Bonnie Adamson. We're gonna be talking about agents and clients and what makes a good match and all sorts of agenty stuff like that. For info about Twitter chats and how to participate in them and get the most out of them, I highly recommend this Debbie Ridpath Ohi article. Hope to see you at one or both chats... and hope to see you kicking around here, too! © 2011 Francisco X. Alarcón. All rights reserved. 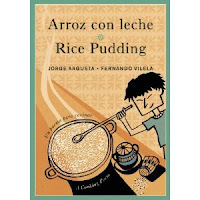 Well, Francisco X. Alarcón has just nailed Monday mornings, all the dragon-breath and porcupine hairiness of it... and the forces that chase the dragon feeling away, too. While music may be the universal language, I suspect the feeling this poem captures is shared wherever kids go back to school (or, dare I say it, adults go back to work) on a Monday... and I bet that's within and outside of our universe, for that matter! If you follow this link, you'll be able to watch a handful of videos in which Francisco X. Alarcón discusses everything from his writing process to being a bilingual, binational, bicultural poet and what that means. You'll hear his poetry, too, and, if you're like me, you'll start off saying "I'll watch one or two" and you'll watch and listen to them all. He's a natural storyteller and fabulous poet (as you can see via his last entry here, too), and I'm thrilled to have him here as part of 30 Poets/30 Days. Yesterday we had ONE LANGUAGE: Listening to Saint-Saens' The Swan by Joan Bransfield Graham. Tomorrow we start with Charles Waters and I Wear Mommy's Dress! For more information on 30 Poets/30 Days and how to follow along, please click here. Joan Bransfield Graham - ONE LANGUAGE: Listening to Saint-Saens' "The Swan"
moon, and sun . . .
© Joan Bransfield Graham. All rights reserved. I love Joan Bransfield Graham's poetic paean to music as a universal language. Like poetry, music can pull us all together... but music doesn't have a language barrier. Since she was inspired by and wrote this poem while listening to Saint-Saens' The Swan, I think we should all listen to it... which we can via the magic of YouTube and Yo Yo Ma... and see if we can't find someone to share the combo of music and poetry with, too. This isn't the first time Joan's mixed poetry and music. In fact, she has a CD called The Song We Chose to Sing that's full of her poetry and her photographs both set to music (and you can see the trailer right here, in fact!). Frankly, I find her poetry itself musical as she weaves words and makes the reader see so clearly (like she did last time she was here with I am the Poem). And that's just one reason I sing with happiness about having Joan Bransfield Graham here as part of 30 Poets/30 Days. Yesterday ended with Alan Katz and 101 Donations. Tomorrow, Francisco X. Alarcón with On Monday I Feel Like a Dragon/El lunes me siento como un dragón! For more information on 30 Poets/30 Days and how to follow along, please click here. it’s nice to give to charity. © Alan Katz. All rights reserved. I'm quite fond of his picture book, Stalling (illustrated by Elwood H. Smith and which came out last year), and its focus on a kid who is NOT ready for bed and is a master staller. OK, fine... the book rang far too true to me. But getting over that, I realized how well Alan Katz knows kids and how they think and is able to turn that around to make such appealing books and poetry. Just last time, when he gave us Ch-ch-ch-check, Please, I'm thrilled to have Alan Katz here as part of 30 Poets/30 Days. Earlier we had Haiku for a Jiving Djembe by Bobbi Katz. Tomorrow, ONE LANGUAGE: Listening to Saint-Saens' "The Swan" by Joan Bransfield Graham! For more information on 30 Poets/30 Days and how to follow along, please click here. My name is Alyssa Keaton, I’m 11 years old, I’ve been watching the news on television about the big oil spill messing up the Gulf of Mexico, and I decided to write a poem about it. I’d slap you human beings in jail. I’d want to smear that oil on you. I had to watch my whole world die. cause this whole stink got started with us. Every-place we go! Every-thing we touch! Do we have to mess things up so much? the future begins today. With me. I was one of the first. Don’t you be the last. © 2011 - a work in progress by Brod Bagert. All rights reserved. Today is Earth Day and also two days past the one-year anniversary of the Deepwater Horizon tragedy... and here we have Brod Bagert using poetry and perspective not only to talk about the world, but to let his audience know that they have a voice, too. At the same time, the poem has a light touch (like last year's Personification) so you don't feel all, well, all covered in goo. I like how the poet not only writes from another point of view, but also gives us details about whose view we're getting. 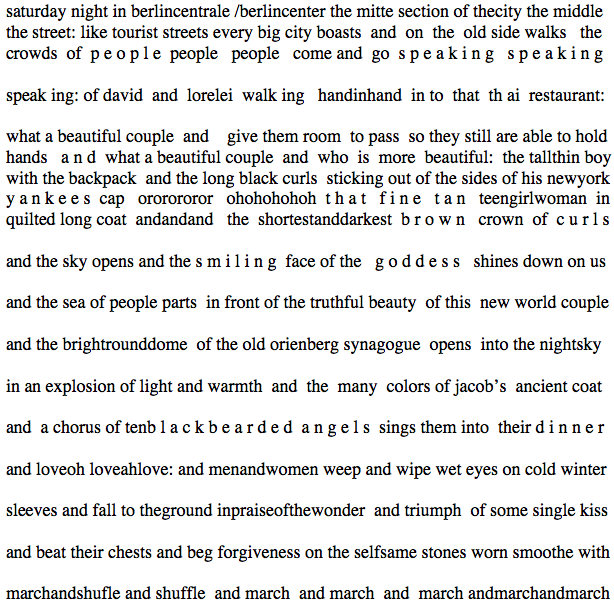 It adds another layer to play with and, having had the good fortune to see a few other poems, I know it is something that Brod Bagert is playing with in very interesting ways. If I... is a perfect poem for this particular Poetry Friday (with the weekly roundup of goodies hosted over at the Book Aunt), and it's just one of the reasons I'm so happy to have Brod Bagert here again as part of 30 Poets/30 Days. We ended yesterday with Julie Larios and Far from Home. Tomorrow... Bobbi Katz with Haiku for a Jiving Djembe! For more information on 30 Poets/30 Days and how to follow along, please click here. © 2011 Liz Garton Scanlon. All rights reserved. Luckily for us, Liz Garton Scanlon not only has a good head on her shoulders, but she puts good words down on paper, too. Here she's playing around with an idiom poem and creating something that, dare I say it, is greater than the sum of its idiomatic parts. I love the turns of phrase and admit that I could read that second stanza endlessly! Good times, indeed. I happen to love the poetry in the words Liz chooses, no matter what she's writing. After the wonderful success of All the World (which, when she was last here, was in the process of winning a skadillion awards), she's come out with Noodle & Lou, a very different story, all about friendship, but so clearly with that same ability to find the right words and put 'em in the right order. (Over at her blog, by the way, Liz is posting a haiku (or haibun) every day of April - well worth a read). Without putting on my fanboy hat too much, I'll just close by saying how happy I am to have Liz Garton Scanlon here again as part of 30 Poets/30 Days. 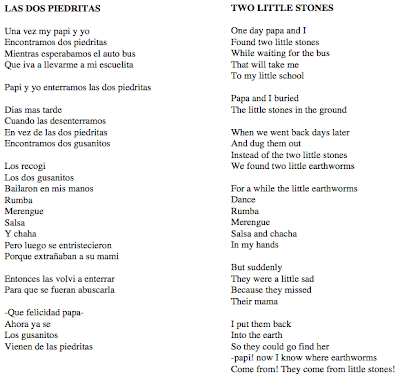 We started the day with Jorge Argueta's Las Dos Piedritas/Two Little Stones. Tomorrow kicks off with Mystery Flower by Ralph Fletcher! For more information on 30 Poets/30 Days and how to follow along, please click here. plywood signs and fiberglass fawns. full of dramatic "tin drum tantrums"
turned out to be verse facility. We called him "Old Banana Paw"
My mind was in a sorry state. and landed unfunded in the UK. What can I say, I’m an Anglophile. I also drove the daily Beatle shuttle. My route was Liverpool to Kidneypuddle. and won five Best in Shows. owes me a huge apology. in the nearby metropolis of Baltimore. with a crab cake at a bake sale. © 2011 Calef Brown. All rights reserved. If you were at TLA last week and happened to hear Calef Brown, I'm told you heard the world premiere of this poem in spoken form. The above is just an excerpt, but I know I'm itching to hear the rest of his life story in verse. I'm pretty sure every detail is true, too, though I suppose a detail or two has been changed due to his "least worst ability" being verse facility. But who knows? Perhaps, just like his last poem here, every word is true. Calef Brown has another least worst ability, I think, and that is his facility with illustration. Most recently, he was let loose on the works of Edward Lear (and with poem choices/intro by Daniel Pinkwater!) and created a truly fantastic, must-have book called His Shoes Were Far Too Tight. You gotta check it out, I say, and then you'll see one of the many reasons I'm so excited to have Calef Brown here as part of 30 Poets/30 Days. "I am God" by Carmen T. Bernier-Grand was up last. 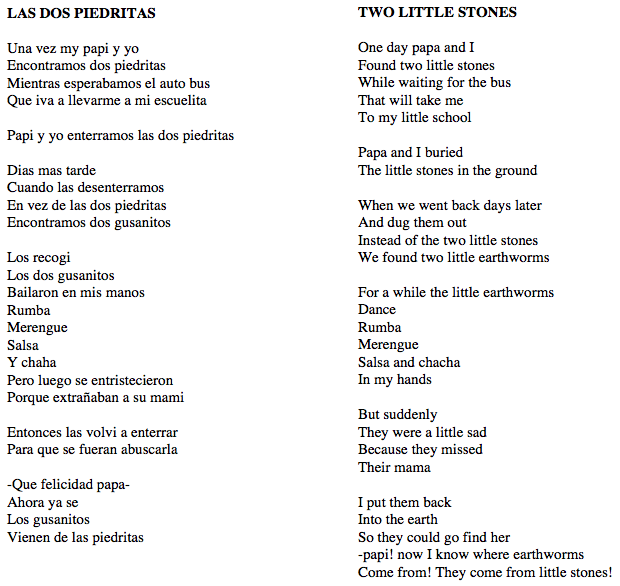 Tomorrow starts off with Jorge Argueta's Las Dos Piedritas/Two Little Stones! For more information on 30 Poets/30 Days and how to follow along, please click here. “God is really another artist. He invented the giraffe, the elephant, and the cat. Picasso paints late into the night, an owl his only companion. when he has emptied himself of writing poems, Picasso paints. Well, now, I can't speak for you, but that excerpt sure makes me anxious for Carmen T. Bernier-Grand's upcoming book on Picasso. The use of a quote by her real-life subject as a launching point for a glimpse further into Picasso's psyche creates a powerful, inviting, almost hypnotic poem. And did I mention it makes me want to read the book? Yeah. It does. This is not the first biography Carmen T. Bernier-Grand has done, nor the first artist she's explored, nor is it the first time she's been here (nor her first collaboration with David Diaz, for that matter). And if you've read her other books, fiction or non-fiction, the power of her words and images won't be any surprise to you. And if you haven't... well... go check 'em out and then you'll know why I'm so happy to have her here today as part of 30 Poets/30 Days. Yesterday, we had Chess by David L. Harrison. Up next, Backstory - an excerpt by Calef Brown! For more information on 30 Poets/30 Days and how to follow along, please click here. It’s time to clear the clutter off the floor. My office might be tidier I confess. I encourage her to shut the door. My wife says my office is a mess. And she’s convinced I keep adding more. I guess she has a point more or less. I regret my office causes stress. I brought this pile of boxes from the store. Was I going to tidy up? Yes. I did try but cleaning’s such a bore. So suddenly I’m under great duress. She’s in a mood I think I’ll not ignore. © 2011 David L. Harrison. All rights reserved. I love the imagination David L. Harrison shows in this poem, coming up with a situation so far from reality - I mean what adult or child ever would create a mess and NOT clean it up? Or ignore, even temporarily, a request to clean up? As if! - and making it seem so of-this-world. Add in the fact that he creates this utter fantasy of a "messy office." Such a thing was unheard of to me, and yet, thanks to this poem, I can now imagine it. I think a child could imagine themselves in such a predicament, too, assuming they know what a "mess" is to begin with. I would note that the fact that he chose to write this as a villanelle is further testament to the poet's skill. Thankfully, the villanelle's a real (if incredibly challenging) form, unlike his made-up "messy office" subject matter. By the way, David L. Harrison's blog is a fantastic read, full of poetry, writing tips, business information, and so much more. I love reading it and his poetry, and, just like last time, I'm thrilled to have him here as part of 30 Poets/30 Days. Yesterday we ended the day with Caterpillar by Ann Whitford Paul. Tomorrow starts off with "I am God" by Carmen T. Bernier-Grand. For more information on 30 Poets/30 Days and how to follow along, please click here. © 2011 Ann Whitford Paul. All rights reserved. Three chapters, three stages of life, two characters (or one, perhaps, really deeply using method acting), images and drama... and all of that in 37 words. That's what Ann Whitford Paul has done for us in Caterpillar, which I think is a lesson in word choice and clarity. I mean, it took me more words than that to get to here! Besides offering up fabulous poetry, Ann has a book that's come out since last time she was at GottaBook called Writing Picture Books. The book's a great resource for anyone trying to write my favorite type of book and definitely worth checking out. For that matter, so her picture books and her poetry which leads me to say, with clarity and brevity that I'm so happy to have Ann Whitford Paul here as part of 30 Poets/30 Days. Earlier, we had Joyce Sidman with Mudbath, Interrupted. Tomorrow... Chess by David L. Harrison! For more information on 30 Poets/30 Days and how to follow along, please click here. a tiny lettuce on your head. don’t you know it’s raining out? © 2011 Joyce Sidman. All rights reserved. Since last she was in these parts, not much has happened with Joyce Sidman's books... well, other than her Dark Emperor & Other Poems of the Night (illustrated by Rick Allen) receiving a 2011 NEWBERY HONOR (and being a Lee Bennett Hopkins Poetry Award Honor Book and being a Cybils finalist and and and). Oh, yeah, her book Ubiquitous, also out last year, was also a Cybils finalist. 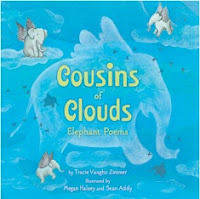 And her Red Sings from Treetops received a Caldecott honor for illustrator Pamela Zagarenski. But other than that, not much has happened with her books. I find her poetry makes me see what she wants me to see, gets reactions I was never expecting to give, and makes me want to join Red and sing from treetops telling others to grab her books and celebrate... so I guess the attention her poetry receives is no surprise. Still, it's fantastic to see... just as it's fantastic to have Joyce Sidman here as part of 30 Poets/30 Days. Yesterday ended with James Carter's go, poem. Up next, Ann Whitford Paul with Caterpillar! For more information on 30 Poets/30 Days and how to follow along, please click here. to give you a stage. my pen and my brain. © James Carter. All rights reserved. OK, so, who wants to join me on a journey to the center of James Carter's brain? I think it'd be fun to be in there and peer out since I love the way he sees the world. Of course, we're getting to experience that perspective already, thanks to today's poem which, just like last time he was here, shows a wonderfully deft touch and captures me totally. I have to say that I'm sad that in the year since he was last here, I didn't figure out some way to see him in action in a school setting. I love watching poets with kids in general, but add in that he's a guitar player, too, and... well... I figure we just have to get him to the States and near me. Right? Good. Until then, though, it's my pleasure to have James Carter here as part of 30 Poets/30 Days. Arnold Adoff was up last with orien berg strasse. Tomorrow we start off with Joyce Sidman and Mudbath, Interrupted! For more information on 30 Poets/30 Days and how to follow along, please click here. ©2011 Heidi Mordhorst. All rights reserved. Heidi Mordhorst had me at hello... or, in this case, with the title of her poem. C'mon, now! Doesn't that just evoke a whole world in those six words (and two are articles!)? I had my own inklings of what might follow, but then she took her own idea and ran with it. I can see the whole scenario she describes play out, and I ask you, what former child can't? Just like last time she was here, I find myself simply loving the perspective of her poems. There's a wonderful childlike point of view yet there's real skill in finding the details and images that let her pull the ideas off and make them into something bigger. Good fun indeed, and just one of the reasons I'm so happy to have Heidi Mordhorst here as part of 30 Poets/30 Days. Earlier, we saw Carole Boston Weatherford's A BAT CAVE: An Abecedarian Bedtime Chronicle. Up next, Arnold Adoff with orien berg strasse! For more information on 30 Poets/30 Days and how to follow along, please click here. ©2011 Carole Boston Weatherford. All rights reserved. Carole Boston Weatherford sure has a way with words and, for that matter, with every letter of the alphabet. Abecedarian poems are a landmine, at least for me, because they never seem to flow or tell the story well or... okay, fine... they never work like this poem works. I love the turns of phrase that make me forget I'm reading a "form" of any sort. I'm just hanging with bats and loving it. Of course, this is really no surprise because that way with words and her range (even just her last poem here would show you) are hallmarks of her work, and that is why I'm thrilled to have Carole Boston Weatherford here as part of 30 Poets/30 Days. 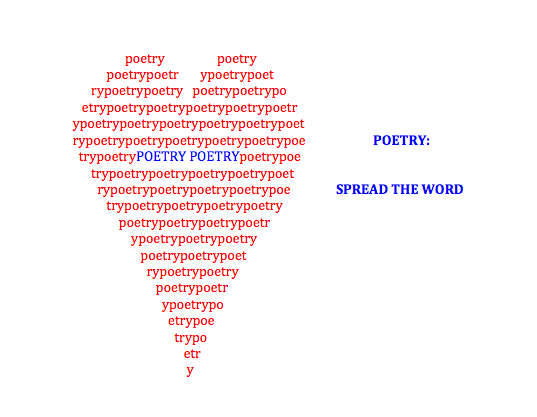 It's Poetry Friday! This week's roundup of poetry-goodness is over at Random Noodling. Head on over and check it out. Yesterday we learned How to Talk to a Girl courtesy of Laura Purdie Salas. Next up... Heidi Mordhorst with The Playroom Floor Writes a Novel! For more information on 30 Poets/30 Days and how to follow along, please click here. The sun and the moon and the star. All are within you tonight. And let you be still where you are. ©2011 Charles Ghigna. All rights reserved. Well, I feel still. Don't you feel still? It has actually taken me a long time to even write this... yet I've had this poem for weeks. I guess that's the "power of words" we hear about all the time. I also guess it's no surprise, since Charles Ghigna had a similar impact here two years ago with part of his "A Poem Is..." series, and in countless books, poems, and other writing, too. Now, as a slight aside, I was angry with Charles on Valentine's Day when he posted a love poem to his wife that raised the bar so high that the rest of us (okay, fine... at least me!) felt like we should just rip up whatever we'd written. To anyone. Ever. Just ONCE couldn't he keep his poetry to himself instead of sharing it? I swear. But, of course the poem was so good that I couldn't stay angry, just like I can't be anything other than thrilled to have Charles Ghigna here again as part of 30 Poets/30 Days. Yesterday we encountered Dinosaur Dung by Elaine Magliaro. Tomorrow... Laura Purdie Salas with How to Talk to a Girl. For more information on 30 Poets/30 Days and how to follow along, please click here. and Mom doesn’t even care! we tell trouble to fly away. they sweep away worry and gloom. We fill the whole room! ©2011 Susan Marie Swanson. All rights reserved. Susan's poetry sings... and if you follow the link here and click "Closer Look" you can hear her poem Trouble Fly sung by a children's choir in a piece composed by Patricia McKernon Runkle. And you can by the sheet music, too. How cool is that? Just like last time, when she shared her poem Wonders, I remain a huge fan and am so happy to have Susan here as part of 30 Poets/30 Days. Yesterday we gobbled up Soul Food from Jaime Adoff. Tomorrow... Elaine Magliaro with Dinosaur Dung! (I'm gonna type that again just for fun: Dinosaur Dung! Yep. That was fun.) For more information on 30 Poets/30 Days and how to follow along, please click here. (even the scandalously lame ones). ©2011 Tracie Vaughn Zimmer. All rights reserved. I want you to join with me and prod Tracie Vaughn Zimmer to get this collection out into the world. I must see it! I want to know what Poetry and Fantasy do at the lake. I want to know if Poetry can change forms (and if she always has red hair). Is Fantasy a meter reader? And does Romance rides a white stallion? It's unfair to be left without answers. Publishers, take note! One of the fun things about this project for me is that many of the poems that appear here either already are from or end up appearing in upcoming books. Tracie's prior poem here, Cousins of Clouds, was the title poem from a book of elephant poems that just debuted less than two months ago. Yay! Now I look forward to Fantasy following in its path... and I'm once again incredibly happy to have Tracie Vaughn Zimmer here (for real - no fantasy!) as part of 30 Poets/30 Days. Yesterday, Avis Harley gave us a bunch of Clerihews. Tomorrow... Jaime Adoff with Soul Food! For more information on 30 Poets/30 Days and how to follow along, please click here.